Winners of the Tony Phillips memorial triples tournament at the City of Peterborough club - Rob Day, Peter Leaton and Dudley Smith - pictured with Tony's widow Jessica and family members. Northants women have withdrawn their teams from the English Women’s Bowling Federation inter-county championships owing to a shortage of players. With the county requiring to fulfil commitments in both competitions – Donald Steward Trophy and Silver Jubilee Vase – the committee decided they could not guarantee having a full complement of at least 36 players for all six matches in the southern section, and therefore, with considerable regret, had no real option but to hand in their resignation. “We had around 33 players registering their interest in playing, but unfortunately a number of them were not available for all six matches, so we felt we would rather withdraw now rather than face making the decision halfway through the season,” commented a NWBF spokesperson. Northumberland had already withdrawn from the northern section for the same reason, and some of the other smaller counties are known to be stretching their resources to the limit. It is anticipated that national officials will now review the structure of the competitions, and if changes are made, then Northants hope to return to the fold in the near future. Northants have been involved in the Donald Steward competition since its inception back in the late fifties. They were runners-up in 1963 and 1966 before winning the trophy in 1985 and 1994. The Silver Jubilee Vase came into being in 1983 and Northants reached the final at Skegness in 2012. Chloe Brett, teenager daughter of World number one Nicky, has been named in a shortlist of 13 players from which England will choose two representatives – one boy and one girl – to compete in the Commonwealth Youth Games in Samoa later this year. The Yaxley-based bowler, who plays out of the Warboys club along with her father, mother and sister, is joined on the list by another Hunts youngster, Harry Ward (Hemingford). All the players have been invited to attend a final training weekend at the Stoke club in Warwickshire on May 16/17 where they will be supervised by England’s Commonwealth Games gold medallist Ellen Falkner, who will be accompanying the selected pair to Samoa in September. Hunts men opened their Eastern Counties League campaign with a narrow 109-114 defeat at the hands of old adversaries Norfolk at Brampton. They continue their ECL campaign on Saturday with a visit to Hertfordshire. Harry Ward (Hemingford), Kierren Murray (Brampton), Lewis Baker (Warboys), James Harford (Parkway). Tom Hall (Eaton Socon), Matt Herbert (Sawtry), Ross Martin, Ed Elmore (both Warboys). Lee, Tom and Lyndsay Swannell (all Warboys), Simon Law (Parkway). Brian Martin (Parkway), Kevin Warwick (Eynesbury), Joe Randall, Mike Robertson (both Parkway). Paul Dalliday (Whittlesey Manor), Toby Furzeland (Sawtry), Robbie Coleman (Brampton), Tristan Morton (Warboys). Keith Thomas (Yaxley), Alan Parish (Somersham), Geoff Barlow (St Ives), Ray Keating (Parkway). 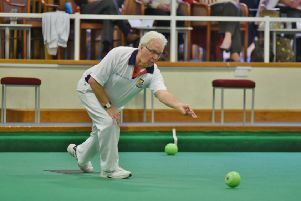 The City of Peterborough club held their first-ever competition on their brand new green at Bretton Gate and fittingly it was staged in memory of former stalwart member Tony Phillips who died recently. His widow. Jessica, donated the trophy in his memory and was on hand to present it to winners Rob Day, Peter Leaton and Dudley Smith.